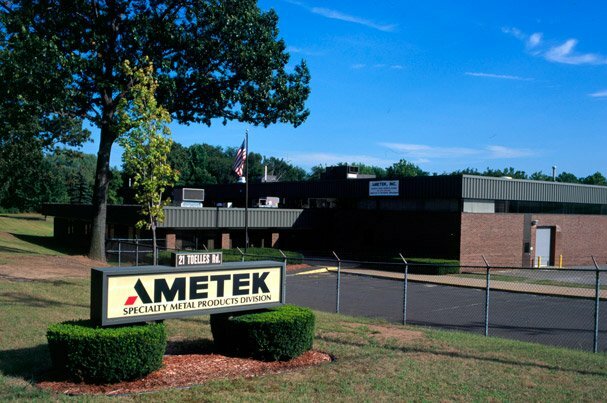 Located in Wallingford, CT AMETEK Specialty Metals Products (SMP) is a pioneer in specialty metal products with more than 50 years of experience and numerous patents in technically advanced metallurgical materials. Scope: Manufacturer of specialty strip, wire, and engineered shaped components from powder metallurgy and cast/wrought products. Components, Bar and Tube: AMETEK's patented Pneumatic Isostatic Forming process produces Plate, Rod, Tube & Near-Net Shape alloys including Pfinodal® (Cu-Ni-Sn), Titanium (Cp & Ti 6/4), Nickel, Nickel-Iron & Cobalt Alloys. Applications include down-hole pressure housings, rock-bit bearing components, sputtering targets, along with other specialized net-shape products. High Purity Metal Strip: Key strip products include Nickel, Nickel-Iron, Nickel-Tungsten, Nickel-Iron-Cobalt, Ductile Cobalt, Pfinodal®, Titanium, and High Purity Iron. We are a world leader in producing Ultra-High purity materials for batteries, electronics, flux core weld wire sheathing, glass-to-metal sealing applications, and high strength age-hardenable Pfinodal® for connectors and bearings. Shaped Wire:We produce both powder metallurgy and cast alloys including Stainless Steel, Copper, Brass, Nickel, High Temp alloys, & Aluminum. Our specialty is close-tolerance shapes for applications in the medical, aerospace, automotive as well as general industry markets. Thermal Management Materials: We specialize in producing electronic materials for heat dissipation applications. Our product offering includes Molybdenum-Copper, Tungsten-Copper, and Aluminum-Silicon Carbide. We manufacture these products via powder metallurgy and pressure infiltration processes for the military and commercial electronics industries. Weld Wire Sheathing: High quality products for demanding end uses. Our premium sheathing materials are used in the most corrosive, high temperature and abrasive environments. We are proud to provide the Cobalt, Nickel and Chrome products needed to extend industrial innovation. Quality Policy: The Ametek/Wallingford SMP employees shall work safely together to manufacture and market specialty strip, wire, and engineered shaped components that meet or exceed customer requirements and expectations through the use of continuous improvement. AMETEK (NYSE:AME) is a leading producer of advanced monitoring, testing, calibrating, and display instruments for process, aerospace and industrial instruments for process, aerospace and industrial markets and the world's leading producer of high-speed, air-moving electric motors for floor-care, aerospace, military, mass transit, business equipment and medical devices.